Our workshops are fully equipped for rigorous MOT testing, together with electronic diagnostics to get to the root of any problem quickly and confidently. Our mechanics are qualified to work on any make of car, but more importantly, they have the practical experience to know just what needs doing, and when. So we won’t carry out work that isn’t required and agreed with you in advance and we won’t replace parts unnecessarily. But we will make sure that you are back on the road with the minimum of delay and inconvenience. We will do everything we can to help you keep your costs down, without compromising on quality or safety. 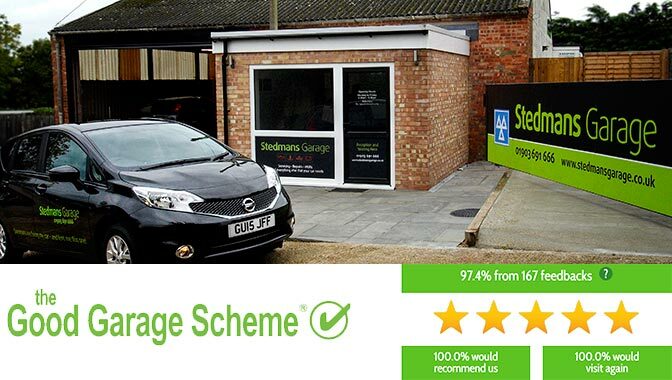 We are proud to be members of the Good Garage Scheme which promotes a strict Code of Conduct and is dedicated to driving up standards in the car servicing industry. But still mindful of keeping the costs as low as possible. Any make, model and problem. We are a small close knit family run business with over 40 years combined experience & pride ourselves on a high standard of work. At Stedmans you can always expect a friendly service. We offer a complimentary pick up & delivery service within the Worthing area or we will provide a customer courtesy car subject to availability. 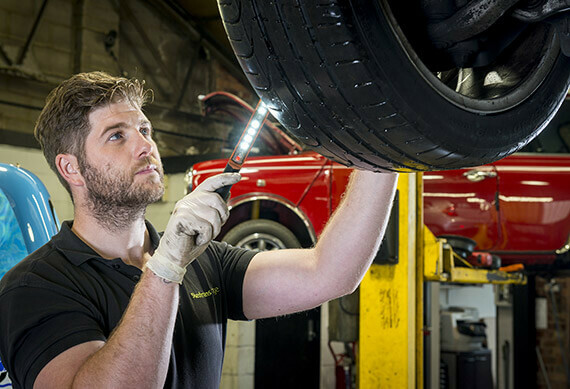 We always keep our customers informed as the work is being carried out and you can be certain of the highest standard of care for your vehicle, all our servicing work and parts we supply are guaranteed. Mark started working for his Dad in Storrington when he left school, before moving to Audi in Brighton to carry out his apprenticeship. He served in Iraq as a Private in the TA and had his 21st birthday during that time. Since then he has worked as a trained technician/Mot tester for the family business in Storrington before moving to Stedmans in May 2011. Mark has grown the business with the help and support of our amazing team, and with Mum Donna working behind the scenes on marketing and admin duties. Paul, Mark's Dad has joined the Stedmans team and is enjoying working back with Mark. He did his apprenticeship at Cissbury Garage, Findon Road specialising in Mazda. He then started his own business in 1984, the year Mark was born. At that time the business was located in Canterbury Road, Worthing trading as Canterbury Auto Repairs before moving to Storrington in 1989. Donna, married to Paul and mum to Mark has been actively involved in the business since it was established in 1984. Working from home has enabled Donna to enjoy being a full-time mum as well as working hard behind the scenes managing the accounts, payroll and marketing. More recently Donna has played a strong supporting role to Paul and Mark as the business has moved, developed and grown. Donna would like to thank our long established customers from Storrington for supporting us in our move to Stedmans and we look forward to serving you for many years to come. Ionie joined in December 2014 in our Storrington branch after working as part of a Management team in retail. Ionie is an absolute gem...she keeps the office running smoothly and makes sure the boys are kept busy and always has a cheerful smile to greet our customers. She is our youngest sons' partner, so a real part of our family! Tony joined us in 1984 aged only 16, and is now an integral part of our family business and we wouldn't be without him. He has wealth of knowledge and many years of experience in the trade. Tony loves spending time with his family, wife Lorraine and daughters Lauren & Chloe. They enjoy family holidays in their caravan. Terry joined us at our Storrington Branch in March 2007 - where he started as a Tyre Fitter. After a year or so he wanted to train to become a technician, so he went on to be our apprentice and is now a fully qualified Technician and Mot Tester. He has settled well into Stedmans. His spare time is very busy looking after a young family of 3 with his partner. Andy is our newest recruit.He studied at University of St Davids in Wales before emigrating to England in 2015. He was formerly a Maintenance Manager at a Coach company and qualified as a Bus and Truck Mechanic. After moving to Sussex he worked for Halfords as a Senior Technician/ Assistant Manager. He joined us in November 2016, as a technician/Mot tester. Andy loves outdoor pursuits and spending time with his family. Our highly trained and experienced mechanics can carry out almost any mechanical or electrical repair on all makes and models of car. We also have the facilities to work on light commercial vehicles as well. If a problem isn't immediately obvious after a manual inspection then we have the latest diagnostic equipment to identify most faults. Any parts can the be ordered and are usually delivered to us the same-day.